Hey LinkedIn – I’m Not Part Of That Group! A friend passed along an interesting email from LinkedIn – and I thought it worth calling out. Apparently my picture was used to entice her to start using LinkedIn’s mobile app – unfortunately, I’m not a user of mobile apps! 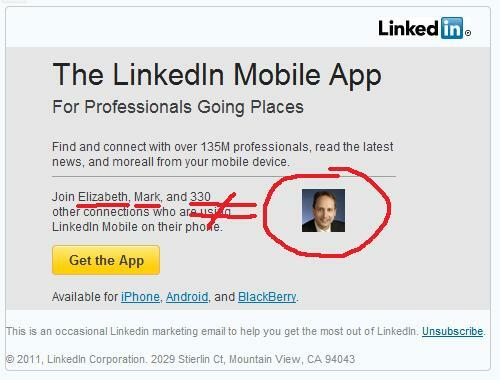 Notice – LinkedIn is suggesting that her connections “Elizabeth” and “Mark” are already using the mobile app (along with 330 other people). And then it throws in my picture! In fact – I received the same email on the same day! 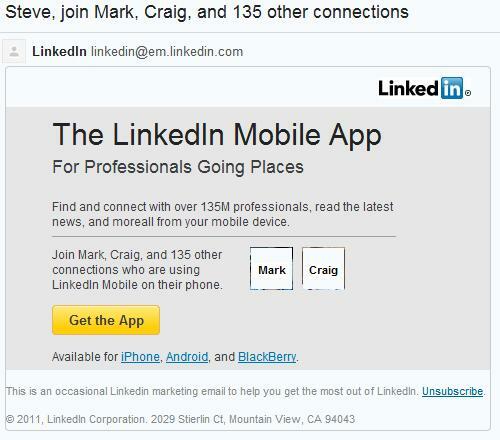 In this case, LinkedIn did use the picture of Mark and Craig. And notice – the LinkedIn copyright folks have not yet picked up that messages still use ©2011. It’s tough for me to point this out because I really think this year is flying by; don’t you? Let’s go for accuracy next time around, ok guys? No related posts were found, so here's a consolation prize: Endorsing Who?.